Humans, it’s safe to say, take comfort in stupid myths. Sure, the mouth of that Great Dane who just slipped you the tongue is cleaner than your own! And yes, you should shave twice a day – it will make your beard as thick and lustrous as God’s. 1. White wine is for white meats; red wine is for red meats. Just forget this piece of illogic. A light, well-structured Pinot Noir is terrific with salmon – or even duck. The stunning heart attack incubator that is foie gras is best served with champagne or a high quality sparkling wine. 2. Sherry is for old bridge-playing biddies. You think this? You are a fool! You can obtain a lovely, robust amontillado for under $20 and use it as your initial early evening lubricator. The interplay between it and some hard cheeses is gorgeous. It even stands up to the tastebud sledgehammer: olives. 3. Port with cigars make you look like a baller. It makes you look like a man who doesn’t care about port, or cigars. There’s too much sweetness in port, too much complexity in a good cigar. Instead, match your after-dinner stogie with something hard – a fine armagnac or scotch. Bottom line: Ignore the rules, and remember that wine is a good, delicious friend that will help you through hard times with its subtle powers of be-drunkening. So go forth and begin the de-bunkening! 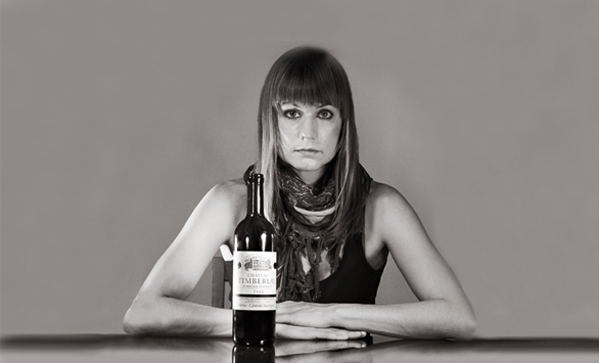 Kathryn Borel Jr., who is pictured above, is the author of the new book Corked. It’s out now in bookstores across the land. (But not in the sea.) It’s about wine, France, her father and death. For more details, visit here.